The purpose of numerology is to gain a better understanding of who you are and what the future might hold for you. When I first started working with numerology, almost 40 years ago, I found the biggest challenge in creating truly personal readings was discovering why two people with similar numbers could end up being so different. The answer is that it is essential to note where each number appears in a chart – not just consider the number’s attributes. You have 4 or 5 key core numbers, plus a wide range of numbers that play lesser but important roles. Without scrutiny, this jumble of numbers creates something akin to numerology soup - a cluster of numbers and personality traits that could apply to just about anyone. But, when you consider the location of each number in your chart, you obtain far more personalized information. If you and a friend have a 5 among your core numbers, you might suppose you have something in common. But if your 5 appears in a different location than your friend’s (a 5 Heart's Desire versus a 5 Personality or 5 Expression for instance) the effect the 5 has will be dramatically different. Over time I noticed another issue. Traditionally, numerologists, including yours truly, have been mindful of two different sides of your personal Numerology chart: your Personality Profile and your Future Forecast. I have not been comfortable with that for several years, as I became more and more convinced that to have a clear understanding of your makeup and the path you are on, it would be more insightful to look at your chart from three different angles, because that's essentially how you exist: you, your path, and your future. Think of these aspects as the three pillars of your life, and learn which numbers represent each area and how they relate to one another. First, there is you, the individual, with your unique mixture of talents, personality traits, idiosyncrasies, dreams, hopes, likes and dislikes, and what have you. These characteristics are reflected in your name. Your full name at birth is the blueprint of who you are - the unique individual who lives inside you. Think of it as your numerological DNA. The logic behind this is easy to see; when you introduce yourself, you say "I am so-and-so," thereby stating who you are (and revealing much more than you might be aware of). 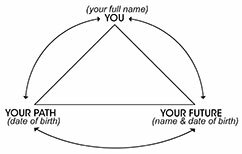 The same applies even when you use a shorter version of your name or a nickname, slightly adjusted to reveal a somewhat different view of you. 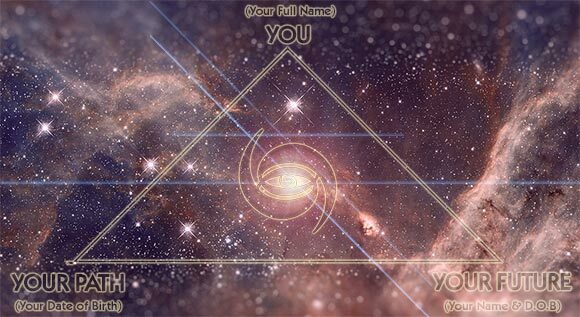 Any time your Numerology chart talks about the core numbers that are derived from your name, the numbers missing in your name, or those that are present in abundance, you should understand it as speaking to who you are. Not your future, not the direction of your life, just you, the individual. This is who you were right from the moment of your birth. The Life Path number is derived from your date of birth. It signifies the window in time through which you came to be in human form, to live a number of years, until you come to another window where you step through, leaving your human form to return to dust. What I hope to convey is that Numerology, if interpreted properly, views your Life Path as indicative of the direction, growth, and advancement you are meant to travel. Your Life Path is a cycle; its attributes are dynamic, active, and evolving. You were given the cycles you need to progress along your life's path. So, we have You as an individual, your traits, talents, likes and dislikes – and, secondly, the Path you are on in this lifetime. Here’s an example (me) to illustrate how each of these aspects differ. I have a 16/7 Life Path and a 16/7 Personality. The 16/7 Life Path, derived from my date of birth, reveals my path to be one of spiritual growth, driven by intellectual curiosity, a search for knowledge and understanding - not about any random thing, but specifically about life and death and the mystery of it all. This is, and has always been, the main ingredient of my life, so I guess Numerology's description of my Life Path number is accurate. But what about my 16/7 Personality? Shouldn't that give me somewhat the same attributes? Well, yes and no. The 16/7 Personality gave me those same traits, but packaged and delivered quite differently. My external presence, now mostly outgrown, thank you very much, was that of a geeky introvert, a quiet intellectual hiding behind Coke bottle lenses, feeling uncomfortable and out of place pretty much everywhere. These traits are typical to a 16/7 Personality, but not a 16/7 Life Path. Had my Personality been a 3, I would still have been the spiritual dreamer and seeker I am, due to my 16/7 Life Path, but my Personality would have been much more social, fun loving, comfortable with others, expressive, and so forth. By the same token, a 16/7 Personality doesn't necessarily set someone on a path to seek spiritual growth, but it will make that person look the part: geeky, quiet, bookish, etc. Finally, we have the third pillar: your Future Forecast. Here too, the numbers are based on your date of birth, because they were set in motion by your birth. The moment you stepped onto your path, several cycles kicked in that began to influence you, as they will continue to throughout your life. This is another beautiful piece of logic behind the science of Numerology. The gears (cycles) set in motion by your birth work together, and if you look closely – as Numerology does – you begin to recognize their synchronicity. Furthermore, when you look at the influence of the numbers that appear throughout these cycles, you get an idea, to some extent, of how future events might unfold. Three sides of a single, amazing story: You, Your Path, and Your Future. When you read your Numerology report carefully, with attention to where each number affects you, it’s surprising the things you can learn about yourself. I’m a fanatic about accuracy, clarity, and continuously improving my work. My profiles are extensive, easily running a few dozen pages. If you have one and you read it in one sitting (concluding it was nice, or not so nice, or confusing, or accurate and it fit you to a T), I suggest you sit with it again. The real value in your report is found by reading it slowly, more than once, taking time for contemplation, and adding your own insight. PS. My previous Numerology Profiles started with the Life Path, followed by numbers in your chart based largely on their importance. The new reports start with YOU (Expression, Heart’s Desire, and other core name numbers), followed by YOUR PATH (Life Path, Challenges, and other numbers based on your date of birth), then YOUR FUTURE (Pinnacles, Period Cycles, etc.). I also added chapters that looks at the combined effect of multiple numbers in your personal chart. You can see a sample of the new Personality Profiles here.